Here at Pro-1 Racing Heads we only use the best materials available in our products to ensure you the highest quality services possible. All of our products are manufactured in the USA, in-house, right here at our machine shop. At this time our products are not for sale individually, but when we perform our top-notch services to your cylinder head, our products with be integrated into our work. 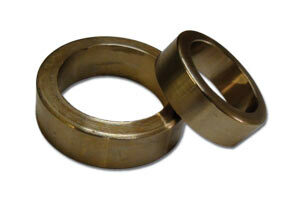 These valve seats are made out of an innovative non-beryllium copper material. Unlike most other copper seats available, our seats lack the hazardous beryllium element, making them non-toxic to machinists. Our seat material also dissipates heat seven-times as quickly as the stock powdered steel seat material. What does this mean? This simply means that when your engine gets to the point where overheating becomes an issue, these valve seats keep the components in your cylinder head running cooler. When your engine is running, the valves become extremely hot. As the valve closes and makes contact with the valve seat for a split second, the valve seat must absorb and dissipate some of the heat away from the valve, into the aluminum of the head to the water jackets to cool. That is where our material's ability to dissipate heat much quicker comes into play. With the stock valve seats, your valves may become too hot and cause detonation and/or other problems. Along with helping to keep the valves cool, the softer compound of Pro-1 Racing valve seats also cushions the valves better than the stock material when they rest on the seat. This will help keep the valve from becoming worn or damaged over a long period of time. Our valve seats might just be that one component that keeps your engine running and prevents a major engine malfunction. 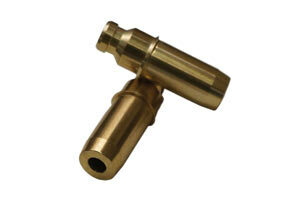 Our valve guides are manufactuer from yet another innovative material - a copper-nickel alloy. This material acts in the same way as our valve seat material, as it also dissipates heat seven-times as quickly as the stock guides. As the valve opens and coses it is constantly in contact with the valve guide. Since the valves become very hot, the valve guide must dissipate heat away from the valve, just as the valve seat does. Keeping the valves cool is a crucial part of preventing an engine malfunction that with break your wallet, and our valve guides aid in keeping the temperatures low. Also, with this material we can create tighter ID tolerances. This will help prevent the valve from moving side-to-side as it opens and closes, thus reducing the risk of "valve wash" from happening.